Cut a piece of cereal box 1 x 8 inches. Carefuly locate the center and punch a hole on exact center. Insert the straw through the hole and glue into place. Before the glue sets rotate to see that the straw is perpendicular to the paper. If using a wood dowel or skewer, push a sharp end through the center and glue. Then cut off the sharp end. Bend the right blade up and the left blade down. Make the bends near the center. Rotate to see that both blades have the same angle and twist. Check the ballance by laying the straw on a flat level surface. If it rotates so one part is down, add weight in the form of glue, tape or glue paper to the light end or side until it can be set in any position without rotating. Reduce the slippery surface of the straw by wrapping masking tape around it where your hands spin it. Fly by putting the straw between both hands with the right hand behind or closer to your body. Push the right hand forward very fast while pulling the left hand back. The spinner copter should fly several feet over head and decent slowly. Tilt the copter forward durring each launch and it should fly out and possibly return to you. Try changing the blade angle to see if more angle or less angle gives better performance. Competition could include distance or time aloft. 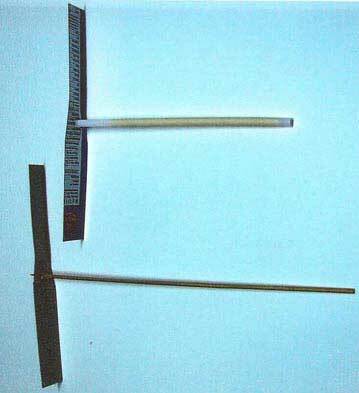 If your copter is unstable when spinning add more weight to the straw in the form of tape or add more straw length to the bottom. Have fun and keep experimenting!